When pondering the Target: Container, I came across the Ars communities thoughts on adding a new Duration: Seal as an allowed Hermetic spell constraint. Its a very good idea thrashed out by these community members (Ezzelino, Xavi, Timothy Ferguson, Gerg, YR7, Cuchulainshound, MarioJPC, GribbletheMunchkin, Jabir, Tellus, Richard Love). Seal – this duration lasts until either the seal on the object is broken, or the object is opened in another way; the seal is active until it is effectively bypassed. The seal duration would be valid when used on a flask sealed with lead, but the spell would end immediately if the flask was broken, even if the flasks lead seal was not damaged. The target of the spell using a Seal duration must be contained by the seal, the container, or the seal itself. Thus the contents of a bottle are valid, but a the object within a room behind a sealed door are not. The seal must be intended to hold the object closed in a permanent manner, and must be applied to an object which could reasonably be sealed. Closing a door, or locking a chest is not permanent enough to use the Seal duration. Typical seals are wax sealed bottles, sealed letters, doors sealed with clay. When used in this manner the seal is inscribed and marked in detail when initially created. Seal is a base: +3 magnitude duration when used. This is a Duration that would require a Hermetic breakthrough to utilise, as while it has a narrow range of applications it does also extend some durations far beyond normal hermetic limits. As a response to the confusion* I had when my players were creating characters, here is a summary how XP is calculated for characters in Ars Magica; using a slightly different method from the default in the style of explanation. The outcome is the same, and I find the points breakdown far easier to spend during creation, especially when done by hand. As there are two broad character types in Ars Magica, the character generation is also designed in two ways: there are rules for Magi, and rules for everyone else. The Companion and Grog (mundanes) rules are very simple, and the Magi rules are far more complicated. XP in 5th edition has been heavily base-lined, so that the points spent in Abilities (skills) are the same as the points spent on Arts and Spells (magical powers). The characters spend them in different ways, but essentially as the points are the same, I sum up the totals, and set checkpoints for the minimum spend in the different areas. The examples below for Magi demonstrate how powerful having post-apprenticeship years are before play begins, so it is worth noting that it is not typical to do this for young Magi, or that it might create an imbalance between characters. Be wary allowing too many years post-apprenticeship, and always enforce the Warp point penalties (2 per year post-apprenticeship). Pick them from MMO directories. The Wow Armory is good and searching by a guild or server will give you a toon list to start from. That said though warcrat players are also a bloody stupid bunch at times as proved by a GuildOx article which shows the popular names by class – no surprise the most popular are god damned horrid. There is a pool of millions of players out there that create characters in mmos every week. Amongst them are truly great,and totally awful names; don’t be shy. Grab a baby naming book. Baby name books are great when your setting is quasi-earth, as they often have lists for “powerful, “fun”, “biblical”, etc. Most used book stores will have one or two, and you’ll not pay much for them. A good book Pdf is also good, and recently I grabbed a 25001 baby name book on Pdf, and its made is so much easier. I was pondering the well known carrying items, like a magic chest, or bag of holding, and thought that the Ars Magica spell guidelines could be extended to have a new target called Container. It would function much the same as T: Room (a +2 mag Target), where all inhabitants of the room are affected. Container – the spell affects everything within a container. This container must have an opening, have a easily discernible structure and boundaries, and be crafted specifically for carrying or moving. The base container may be of any size up to a coffin, large barrel, or cauldron (size +0 as base). A key difference is the container does not have to be closed or locked to be valid, or even be water-tight as cups, bird cages, vases, sacks, or backpacks are examples of valid containers. A sack or pouch could not really be considered a room. Container may also be used as a valid target for Creo magic, allowing the mass crated to be up to the volume of the container, as long as the amount of material crated is large enough; thus an advantage over T: Room which cannot be a valid target for creo spells which create things. With an increase in magnitude larger containers are allowed, such as +1 mag to allow affecting the contents of a massive chest, and +2 mag to affect the contents of a horse drawn cart. The fundamental difference between using T: Room vs T: Container is the usage of the containers as typically being portable. Some hermetic spells may make use of T: Room to achieve T: Container in the setting, and I’d suggest this guideline be along side (although probably replacing it) for those effects. As a minor hermetic breakthrough T: Container seems good enough to be worthy of a Bonisagus’s time, but still not so overt in power to be abusive. It would sit within the spell mechanics at the same degree of power as T: Room, and is intended as an extension to the regular targets already in the game, rather than as a target that would require a special virtue to use. These spells and effects demonstrate the use of hermetic magic in enhancing physical combat, typically for others. While it is easy for a magus to destroy or impair a mundane opponent in an overt manner, these effects can be used in combat in a far more subtle way than fireballs, walls of earth, or lightning bolts; and may also be the basis for effects in enchanted devices for companions. A spell to increase Soak for a character matches the guidelines as a core effect. As a base effect a +2 bonus to soak is a significant combat advantage, while keeping the spell level small enough to not be considered a powerful effect. The bonus to soak guidelines offer a +1 Soak for each +1 magnitude of spell, so the spells above could be raised or powered by a few levels to provide a different bonus subject to what the caster desires. The casters body is enhanced and toughened, gaining a +2 bonus to Soak for the duration. From the Ars Magica muto corpus guidelines p. 132. 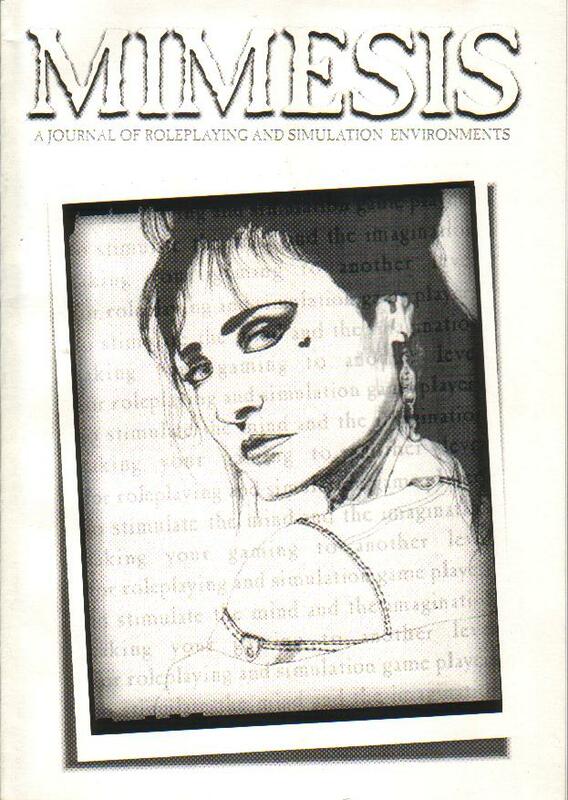 Back in the dim dark of my rpg life I was involved in writing and publishing an role playing game magazine. We were a rag tag (unskilled) group of optimists (confused) who thought it could be done better. And for one issue at least it was. I learn more about making people complete work, deadlines, printing methods, budgets, and haggling with stores than I did about roleplaying, and it was my first real action as a author that went somewhere. Just recently I went sifting through the inter-web and found a rough table of contents, and the cover design. I’m chuffed something of it still exists, as I really thought it was only memory.In that edition I wrote an article about advancing Ars Magica magi from apprenticeship, which fitted to the third edition rules, and another article about using sorcery with an Egyptian feel. From memory the Apprenticeship rules would stand up today, as I remember being really proud of them. On the other hand I really had no idea if the lore of Egypt in the middle ages matched at all what I wrote, so I suspect the “sorcery” was far from historic, but hey; it was content. Starting a mag with two articles on Ars Magica seemed like a great idea at the time. It makes me think that the content freely given via blogs is content that would probably never see the light of day, and a slight percentage might have been used in fanzines and publications like this one.The Internet age grants us a massive capacity to share our rambling thoughts, but also to share real value, and if i had my time again I’d probably opt to produce an e-mag rather than a print mag, and pay for it via ad-clicks. The cover art was by my brother Simon, who I think did an excellent job too, and given this was the pre-internet days (well very early use-net and pine days) having a team collaborating on a single edition, with fancy layout and artwork throughout was something different for a bunch of smelly gamers. Apprentices in Ars Magica Starting out puny. Interview with Katherine Kerr Roleplaying and books interview. Sorcery for Ars Magica Rules for incorporating a new magic type into Ars Magica, the ancient Egyption srt of Sorcery. Also has conversion notes for GURPS and AD&D. Magic in Roleplaying and Reality Magic, magic everywhere…. Subscripions are $20 for 4 magazines. The magazine has a light cardboard cover and is 64 pages long. The magazine is printed in black and white and is set out quite well. If only I could get a digital copy again, and post that up too.